Okay, so the new Thor has been revealed as Jane Foster, now can we all go back to sleeping at night? Well sleeping at night, unless it's actually Panthor that gets you excited. In that case you'll turn to counting sleeps until Dark Horse Comics unleashes the He-Man and the Masters of the Universe Minicomic Collection hardcover this October, reprinting ALL the mini-comics ever packaged into a range of M.O.T.U. action figures. As a fan, I still have with me the mini-comics from the figures prior to the time when the Filmation franchise cartoon turned following mini-issues into a similar (*cough* weaker) family friendly style. These pre-Filmation beauties still define MY Masters of the Universe, with their darker adult fantasy based plots and detailed artwork (including some by a pre-Ghost Rider Mark Texiera!). Back in their day they stood out like the Marvel comics of old for not speaking down to their young audience (i.e. me). In fact, from 'womaniser' Prince Adam and Tri-Klops as a bounty hunter demon army leader, to Zoar and the fact that Teela with her snake vest on is a nature-based Goddess, while Teela sans-reptile based body armour is a hot blonde amazon warrior of Eternia, these elements are still key aspects of how I see the battle for Grayskull in the rearview mirror. Heck, there was even a dimension of Skeletors! Seeing these early un-kidified issues enlarged in the 6 x 9", 1,232 page collection alone will be worth it (but incase you're hoping, it will also include right up to the current M.O.T.U. line mini-comics - yes, including She-Ra's). AWESOME! finally something from Dark Horse worth buying! 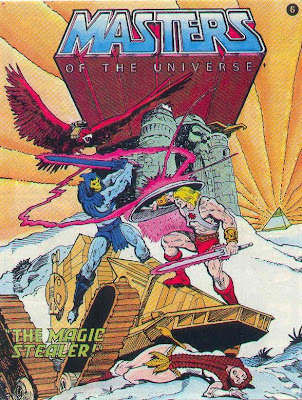 i used to have a bunch of these mini-comics including this one back in the early 80s when i was collecting those Masters of The Universe figures. by the way Dan check your email i posted something cool yesterday for Dr. Doom fans. Thanks Dave! I think like with the Kenner Super Powers, getting these comics when you brought toys in the 80's was part of what made the decade a great one to grow up in. and grow up in that decade i surely did Dan for me it was from 8 to 18 years old. and it was a great decade indeed. i had some of those comics from the Kenner line of Super Powers DC figures to. 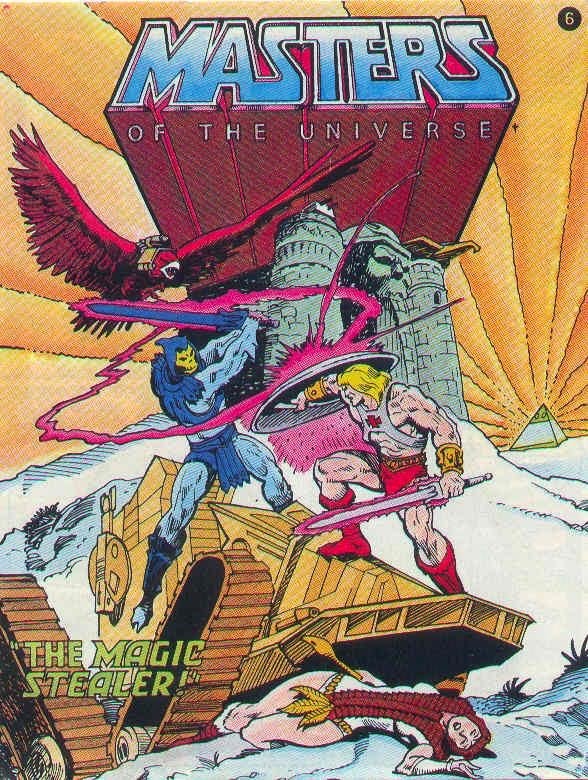 as for Masters of the Universe it's interesting to note that the mini-comics from the first line of figures were done in a fantasy style illustration with all the text running along the bottom of each page not at all like those old Prince Valiant comic strips. they later started doing the comics in a more traditional comic book style in terms of art and dialogue and even though the stories were a bit simplistic as one might expect from an 80s mini-comic you can see from the clip art above the art work was quite excellent. saw your comment on the ROM blog let me clarify it was an email letter they printed. email or paper letter it was still cool to see it in print. I briefly owned one of these before reading it and throwing it away. Hey, I cared more about my Tri-Klops than a silly comic. Ah the ignorance of youth. for anyone who's interested you can read the entire mini-comic collection (or which ever individual issues) here if you don't feel like waiting till October for the TPB . . .
-Yeah, I was SO pumped for this when it was announced! I can see I am not alone!!! Now I don't have to worry! I can get ALL of them, in vibrant, mint condition, collected, for wayyyyy cheaper! This prospect makes me SO very happy!